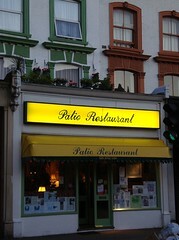 Patio was a Polish restaurant on Goldhawk Road in Shepherd's Bush, just across from the west end of Shepherd's Bush Green. According to Google Street View, it closed down by September 2017. Polish restaurant on Goldhawk Road in Shepherd's Bush, just across from the west end of Shepherd's Bush Green. It's been around since the 1980s. The interior is lavishly-decorated photo, and there's even a piano wedged in among the plasticky-paper-cloth-clad tables. Kake and bob visited on a Friday evening in May 2009. We hadn't booked, but there was no problem finding us a table; indeed, arriving around 7:45pm we were the first diners of the evening, and there were still plenty of free tables when we left shortly after 9pm. We went for the set menu photo (£16.50 including a shot of vodka), since it looked more interesting than the a la carte photo; this turned out to be a good decision. A basket of bread (neither bad, nor notably good) arrived shortly after we sat down, along with a small dish of very tasty pork and apple spread photo. Although we didn't explicitly ask for this, it did appear on the bill. Kake started with the herring with apple salad photo. It was pretty good; although the herring would have been too salty on its own, it was just right with the accompanying shredded apple salad, sour cream, lightly pickled red onion, and thinly-sliced green cabbage. A shame about the two pieces of apple set on the side of the plate as a garnish; they were so browned that they'd obviously been sliced quite a while in advance. bob had the bigos (hunter's stew), which he seemed to enjoy. For mains, Kake went for the assorted pierogi photo; these were fine, though one of the fillings was a little watery. The potato-cheese filling was perhaps my favourite. bob had the golabki photo, which again he seemed to enjoy. Generous servings of vegetables arrived alongside — boiled carrot, broccoli, cauliflower, and green beans; cucumber and dill salad; saute potatoes. Following our mains, we got to choose which vodka we'd like for the shot included on the set menu, then a dish of fresh fruit pieces to share arrived pre-dessert. Kake was too full for actual dessert, and ordered a second vodka instead, which pleasingly wasn't charged for. bob had a piece of cake or something. Note that it's unclear whether coffee and tea are included in the set menu; some reviews say yes, others say no. Kake's verdict: I'd come back, but I'd like to try some of the other Polish places in London too. Accessibility: A step up to get in, and toilets are down a flight of stairs. Last visited by Kake and bob, May 2009. Last edited 2018-02-05 16:23:24 (version 3; diff). List all versions. Page last edited 2018-02-05 16:23:24 (version 3).